Welcome to the Zva Creative June Blog Hop! If you arrived here from Nicole's Blog, you are in the right place, if not you might want to start at Zva Creative Blog, so that you don't miss any of the designers beautiful creations. Hidden along the hop are FIVE Zva Creative prize packages, so it's important to leave a comment on as many blogs as you can along the way. Winners will be randomly chosen after the hop is over. Before I share my card for the hop, I wanted to let you know, you can now purchase Zva Creative products on Amazon! How cool is that! Click here to see all the fabulous Zva products available on Amazon. To create my card, I used Our Daily Bread Designs Some Gave All stamp set, pattern paper from the Bo Bunny Anthem Collection and Zva Creative Red Crystal Flourish Gems (CR-06CA-107). 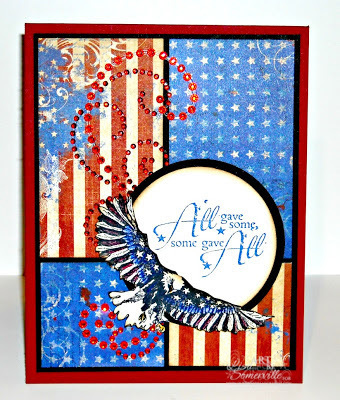 The Eagle is stamped in Black Archival on Vanilla card stock, cut out and colored with STAEDTER Karat Aquarell Watercolor Pencils, the sentiment is stamped in Brilliant Blue on a Vanilla panel, then die cut with Spellbinders Circle Dies. The Red Crystal Flourish reminds me of Fireworks. The Blog Hop runs through 11:59 EDT on Tuesday, June 25, 2013. Be sure to check back on Wednesday, June 26th, to see if you are one of the lucky Zva Creative Prize Package winners! The winners will be announced on the Zva Creative Blog. Thanks so much for stopping by, your next stop is Anna's Blog! Our Next DT Blog Hop will be on Monday, July 29th! Love your card and that saying is just the "best"! Very patriotic. Perfect for this time of year! Wow, your card looks amazing! I love the patriotic theme! Great card and great saying! oh wow This is Outstanding!!!! 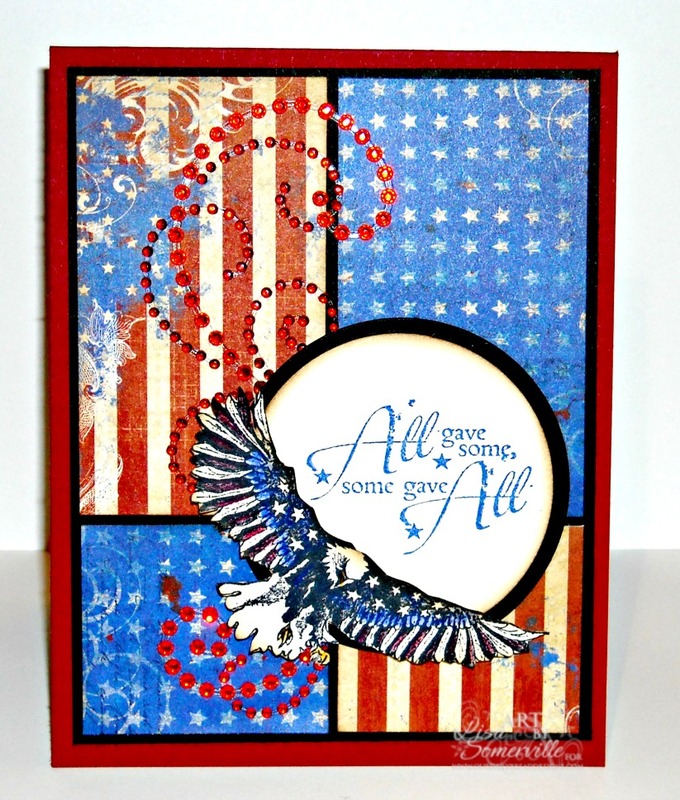 Superior patriotic card!!! Well done!! I love your card! I just got this paper from scraps of darkness and I'm dying to use it. Now I want that red zva bling to go with it, looks awesome!! Lovely sentiment as well. This card is superb! Perfect for the upcoming American holiday! Love that sentiment. Perfect for your beautiful card. Love the swirls behind the soaring eagle. Great card!! That is so cool that ZVA is now on amazon!!! I will be sure to post on Facebook about the hop and ask my LSs to carry ZVA! I hope I post a comment on the ZVA blog, I am having trouble!! Great card Lisa, love the rhinestones against that paper. Love it! I love the design of your card and the papers you chose. The eagle turned out awesome and the beautiful swirl does look like Fireworks. Super job! perfect celebratory zva card!!! well done. Perfect for this time of year! Such a beautiful card thank you for sharing! Your card is so awesome-the paper, the eagle and the sentiment!